The Family Wash was on my radar from Instagram and other things, so when my boss asked us to pick a place for a weekday brunch together, it made the cut! It was a Monday, so a tough day to find open restaurants, especially with breakfast. Family Wash serves breakfast all day and night, and they have a ton of options! The place has a garage vibe that is really hipster and eclectic, and the bar and band areas look very cool. I'd love to come back for an evening visit, as my pancakes were delicious. My one complaint was that the blueberries weren't mixed into the pancakes... I'm used to blueberry pancakes as one thing, and the berries as a topping surprised me. But it was still yummy, and the service was pretty good. 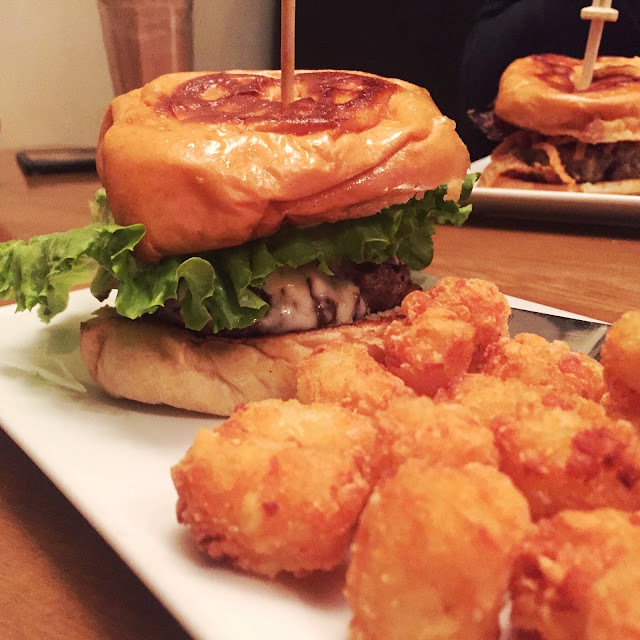 We've been fans of Burger Republic since 2013, and we also love their location in the Gulch! I felt like it was worth mentioning here, because it's still good. We had a giftcard and enjoyed ourselves a lot when we visited. I was staying downtown for work, and I needed to grab lunch before a meeting. I walked into Sun Diner, a pretty new spot at the time, because there aren't a ton of restaurants downtown with awesome reviews. This one looked intriguing. I loved the decor and layout! Really fitting for Music City. The food was pretty good. I had a breakfast burrito. The potatoes surprised me because there were sweet ones in the mix, but not bad. I got the wrong tea from my server, but it was corrected pretty easily. My one complaint is that I had to pay at the register, which is located by the door, and there just isn't much space there. Overall, I'd say this is a safe bet when you're downtown, and I think it would taste even better at 3am. After all, it's a 24-hour diner! On the brewery front, Dan and I visited Bearded Iris for an alumni party I was attending. They don't serve food, but they have this really cool industrial meets vintage taproom area that's worth a visit. And there's free parking! Overall, the spicy tuna guacamole is what would bring me back. I wish the potatoes had been crispier, but we ate until we were stuffed anyways. It was really a delicious meal, and now I understand why the reviews on Yelp are so good! Oh, and the caipirinha I had was delish too. I'd come back to Americano to drink and munch on tapas with friends. The best food is eaten shared like that!